I don’t see how I was unaware of this phenomenon for two years. 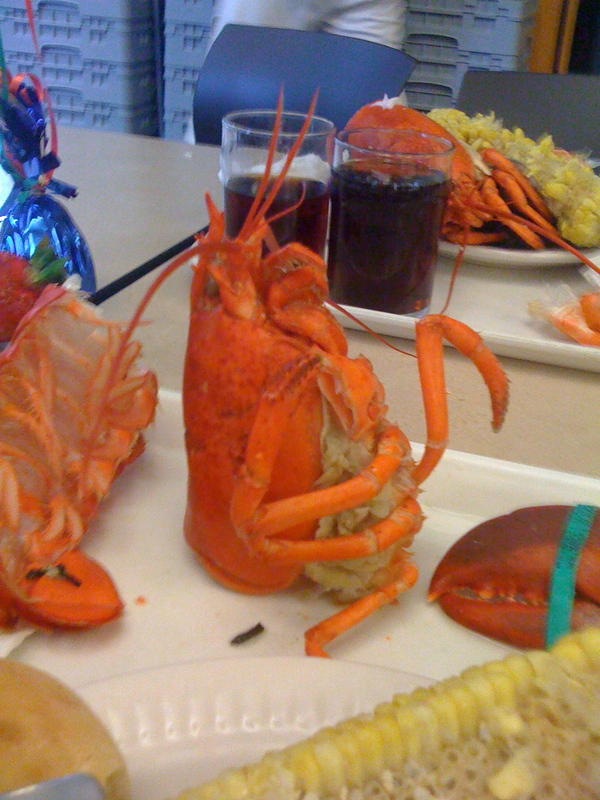 Olga tore me away from Siebel Center to go with her and Kellie to the most ridiculous thing ever: Lobster Night at the campus dining halls. 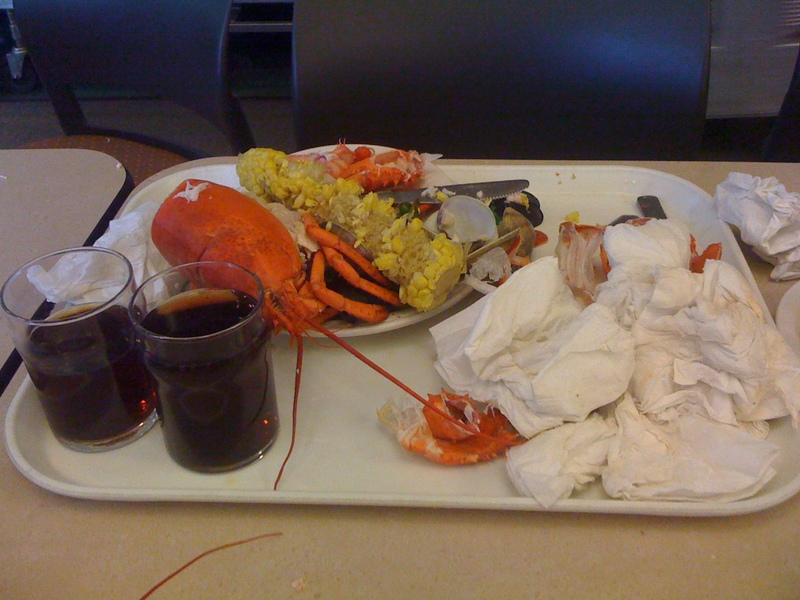 The line didn’t quite wrap around the entire dorm but it was pushing it, and once we entered there were vast lines to be served said lobster one-by-one by a dining hall worker who enjoyed naming lobsters as he dished them out (I believe Olga’s was Inglourious Basterd, and I didn’t catch my lobster’s name). This is what I did to the poor thing. Made him into the monolith from 2001. Olga went all-out on this meal. Her lobster enjoyed spooning with the corn. Haha, bravo. Lobsters rule, btw. Mmm, I missed out. They didn’t have this at FAR/PAR, and I was insufficiently dedicated to go elsewhere for it. Oh well. @Dave: Haha, what you find funny about my posts is always funny to me. @Jeff: Apparently FAR/PAR does miss out. 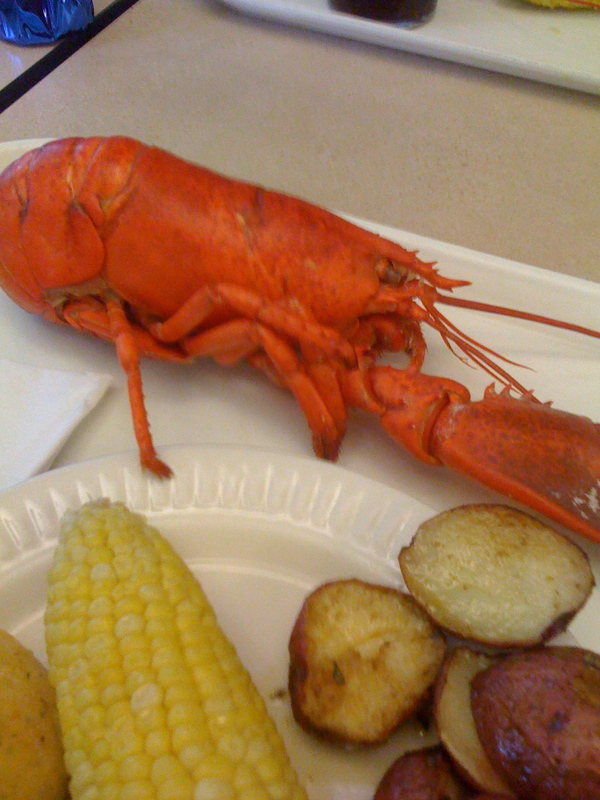 I would have had the opposite problem though, had Olga not thoughtfully warned me / invited me to lobster night. I probably would have died of shock if I’d just shown up and there was lobster everywhere.